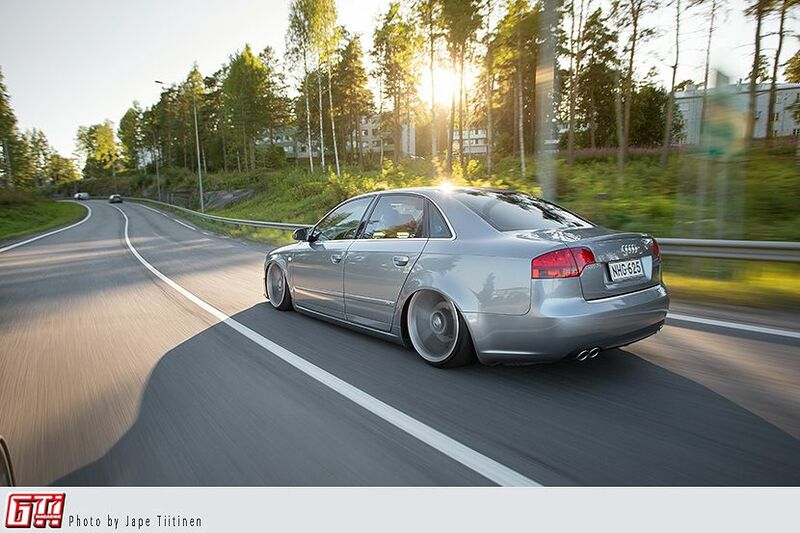 This particular A4 is quite possibly the lowest Audi B7 in Finland. DTM inspired looks and some individual modifications separate this car from the herd, especially when it's towing a fishing boat behind it. See, it's a daily driver. 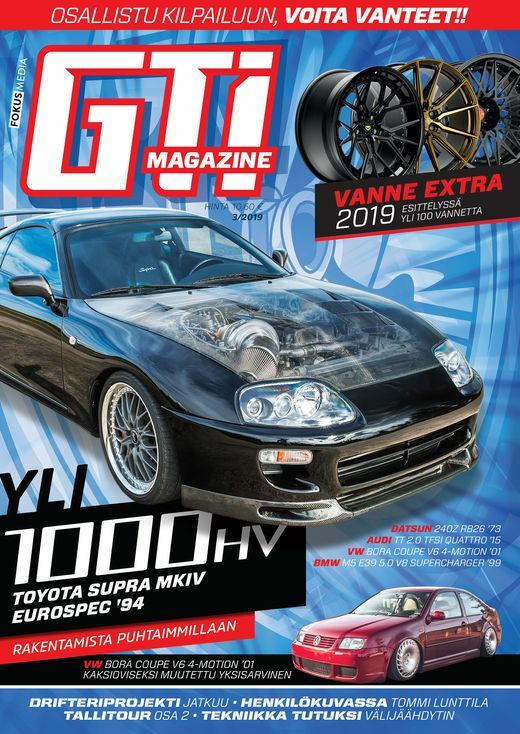 Janne Manninen has always wanted to drive lower than what is the approved average. 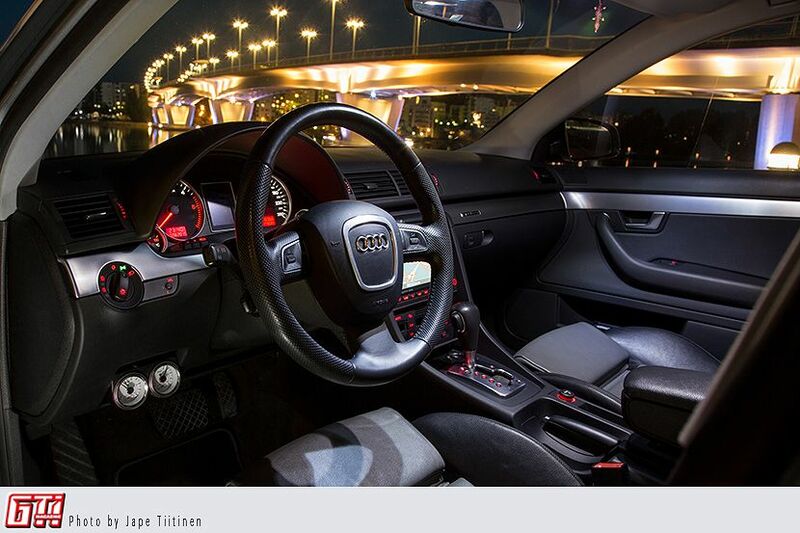 He bought this Audi in 2013, when he was on the search for a well equipped car with a big diesel engine. The first criterion is more of a running joke, since pretty much all cars in Finland are poorly equipped, and could be more or less described as ”soviet”. 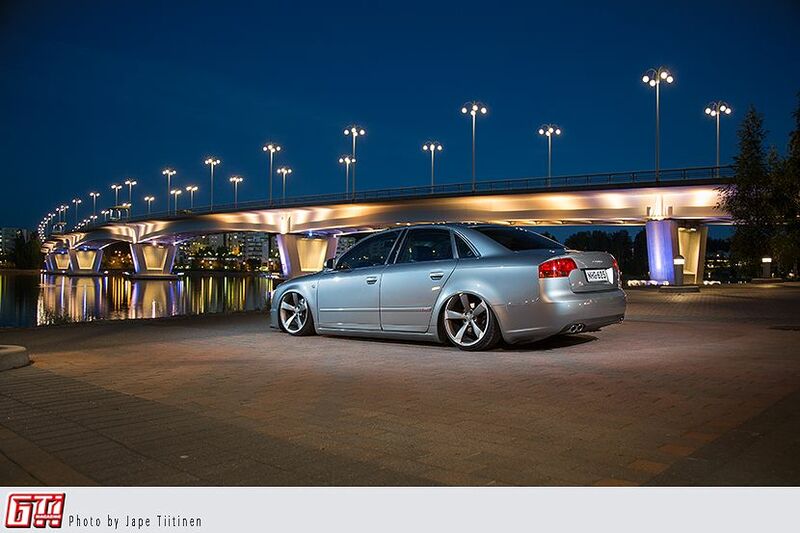 This A4 didn't really boast with accessories either, but it was very cheap and had low mileage, so Janne bought it without hesitation. The good thing about accessories is that they can be retrofitted if you're willing to do some work. First thing on the list was the steering wheel. Janne ordered a sport steering wheel from eBay to replace the dull, four-spoked wheel that was the stock option for the base model. The new wheel (from a 2010 A5) came with paddle shifts and all the necessary controller boxes and wires needed for the swap. The stock four-spoke steering wheel had a very different airbag than the new one, so the new steering wheel needed some modifications. Next Janne upgraded the computer and installed a RNS-E navigator. While installing the latter he also upgraded the glove box with air conditioning, which was basically a ”bolt on installation”, according to him. 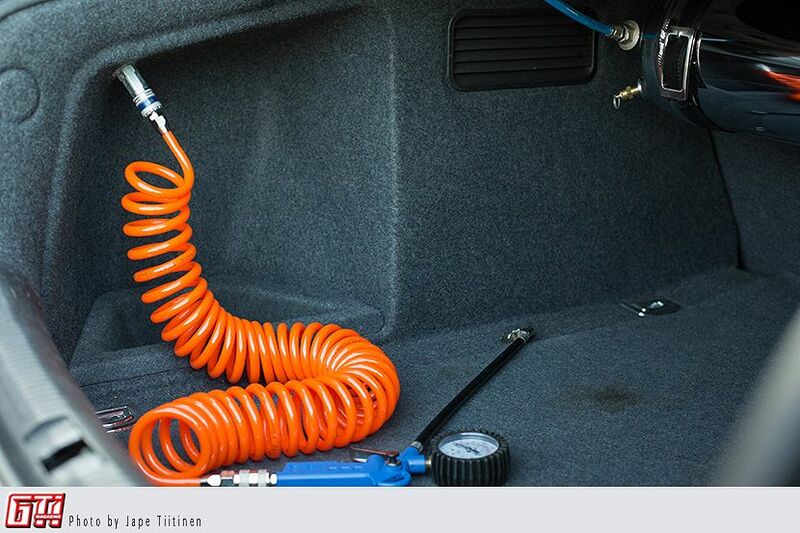 The decision to install air suspension was made when the car was bought. The car is driven in hard conditions, as Janne needs to drive between and to construction sites. The air suspension consists of G.A.S struts, a Viair 480 compressor and a five gallon chromed tank. Magnet valves and other smaller parts were bought from Lowtoys and local hydraulic shops. The controller used was a AVS 7-button model, but it was heavily modified so it would fit in the ashtray. Janne created a remote controller himself, that enables the front and rear axle to be lifted independently. The air suspension is installed so that everything else but the air tank is hidden under the false floor, because the car is used as a work mule and a lot of space is needed. The air tank is strapped to the roof of the trunk with leather straps. At the edge of the trunk there is an output for air, which can be used to fill all kinds of air beds and leaky Chinese tires. The whole package can be dismantled in a few minutes, if maintenance is needed, and this has proved to be a very functional solution. Janne installed all the airlines himself in sub-zero conditions, and the bags were installed with a mate during a weekend. The car was originally equipped with the S-Line package, which is not exactly a rare sight. To separate himself from the crowd Janne started to harvest some DTM edition parts, which are rarely seen around here. Janne tried to save some hard earned bucks by buying a used bumper from eBay. As it happens, the mailman delivered a broken bumper, and fixing it cost as much as if he had bought a brand new DTM bumper in the first place. A RS4 front grill was bought too, but it had to be butchered because it doesn't fit the DTM bumper as it is. The front end was finished with a carbon fiber lip and a flat register plate base. Looks pretty awesome, especially when you add DTM skirts and 9x19” Rotors that sit deep. And deep they sit, thanks to the shortened struts and removed bump stoppers.